Following a superbly practical 3-Stage Under Counter water filtration system, this product comes equipped with elements that make it better than a Watts RO system. A pre-filter works to extract sediments that might otherwise block the second and third filter stages. Places where tap water contains higher-than-average silt and sediment quantities will find this product a great fit for their clean water requirements. The flow rate is the same as that of Watts, though, and the equipment comes with a neat brushed-nickel faucet. So you’re looking for a no-fuss water filtration system with decent performance that delivers clean, healthy water for your family’s needs day after day. Well, look no further than the Aquasana AQ-5300.55 3-Stage Under Counter Water Filter System. Enjoy the taste, purity and convenience of bottled water at much reduced costs right at home, without contributing to the carbon footprint with the endless disposal of water bottles. 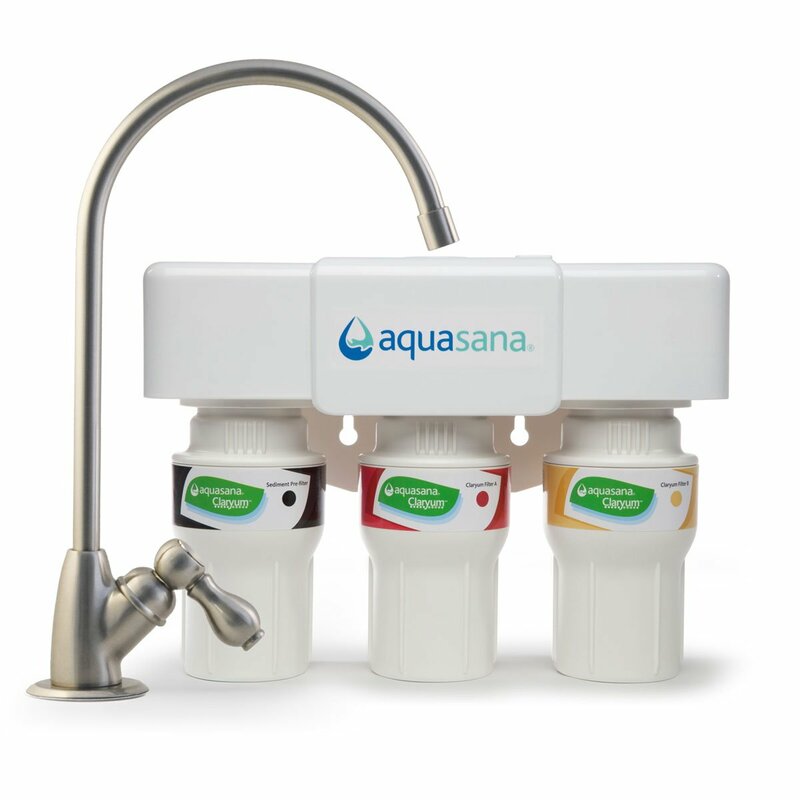 Aquasana AQ-5300.55 is a 3 stage water purification system that eliminates 66 types of contaminants. It’s 20-micron pre-filter traps sand, dirt, rust and other sediments that could clog and damage your unit. The Claryum® filtration technology has been NSF certified. The filter process tested to confirm that over 97% of chlorine, chloramines, heavy metals like lead, chlorine-resistant cysts like giardia, organic chemicals, herbicides, pesticides and VOCs are removed during its process. Beneficial minerals like calcium, magnesium and potassium, however, are retained, so that the pH balance of the water is maintained, and you receive optimal hydration with every glass of water. It can fill 0.5 gallons/minute; its flow rate is 25% faster so that you don’t waste time every time you need a drink of water. The filters can purify about 600 gallons of water and have a 6-month lifetime. They are easy to maintain and replace – you just need to twist them off. ; no need to disconnect hoses or water lines. The Aquasana AQ-5300.55 3-Stage Under Counter Water Filter System is a smart system – it warns you when you need to replace the filters, so you need not keep track of dates. The unit comes with a stylish all-metal finish faucet that can match your existing kitchen décor. With its minimal wastewater generation and negligible number of disposable plastic parts, this is an eco-friendly system as well. This product has been rated at no.4 among the top 5 water purification systems in the US. Customers on reputed shopping sites like Amazon and EBay give it 4 out of 5 stars, with installation ease being mentioned as the best feature. The Aquasana AQ-5300.55 3-Stage Under Counter Water Filter System is an excellent choice for people living in areas where the water source has a high volume of sediments and where the pressure of the water flow is decent. It is affordable, easy to install and easy to maintain that delivers value for money performance.